Here’s an exercise for you: Name the single most important thing your enterprise organization can do to get ahead in today’s marketplace saturated with savvy consumers, multiple brand touch points, and a race to the digital transformation finish line. Got it? Did you say competing on pricing, fine-tuning new features and benefits for your product or service, or even finding new ways to leverage technology to meet your bottom-line goals? If you did, you’re wrong. Those strategies all matter, but they’re also shortsighted. Today, your best bet is to compete on customer experience—here’s why. No doubt about it, you need to serve your customers phenomenal digital experiences to foster better outcomes for your business—that’s a no-brainer. Nailing digital transformation helps you do just that. My colleague and fellow Futurum analyst, Olivier Blanchard recently wrote a thought-provoking piece on that very subject: Digital Transformation: Breaking Through the Noise that is worth the read if it’s not yet happened across your radar screen. That resonates with me because Olivier pays homage to the importance of technology in digital transformation before mentioning that the real key is a cultural transformation from within the organization. 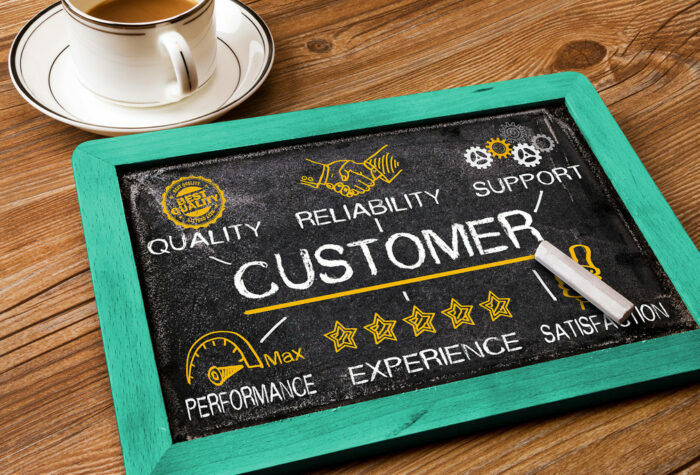 Building an agile business means being willing to reprioritize if the market calls for it, and the market is calling for a focus on customer experience (CX) management—i.e., approaching interactions with customers with the intent to exceed their expectations and build loyalty, and ultimately advocacy. Is your brand listening? The “real proof versus simple claims” part of that quote confirms what I already think: all too many businesses pay lip service to the importance of CX management instead of actually laying the groundwork to do something about embracing creating a business committed to providing a spectacular customer experience. Thanks to big data and a breadth of analytics tools available, CX doesn’t have to be just another empty buzzword. Smart businesses use tools and technology to gather data, analyze it, and apply it in ways that foster engaged, satisfied customers. The general consensus is that CX management does indeed matter a great deal, but the follow-through to turn that into action is where many brands falter. Forrester Consulting in conjunction with Accenture recently released a report speaking directly to this hot-button topic. Fifty-two percent of respondents to the global study indicated they considered their brands to be ahead of the competition or even “best in class” in their industry, but only seven percent reported exceeding the expectations of their customers. That doesn’t add up. 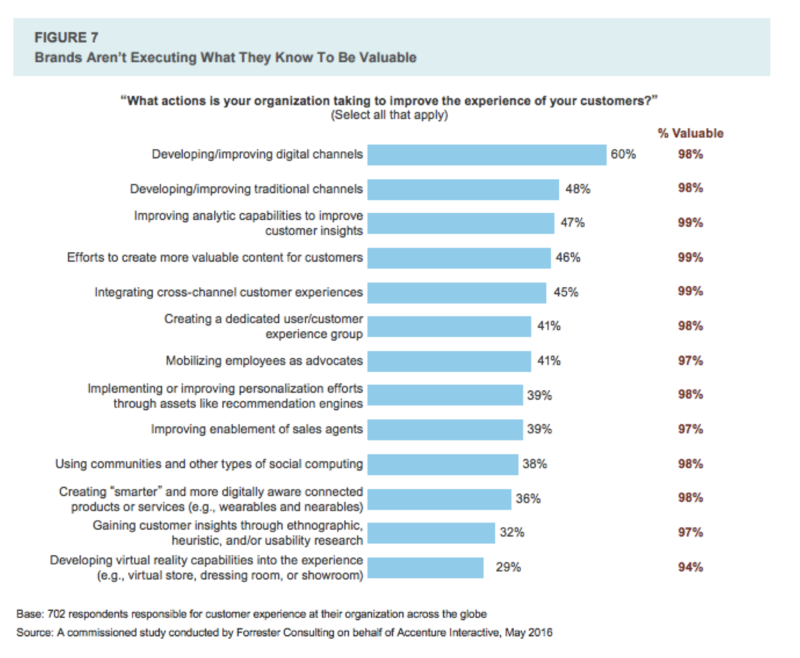 Furthermore, Figure 2 below shows that while brands can identify what actions will add the most value to the experience of their customers, the stats on how many of those initiatives are executed are underwhelming. 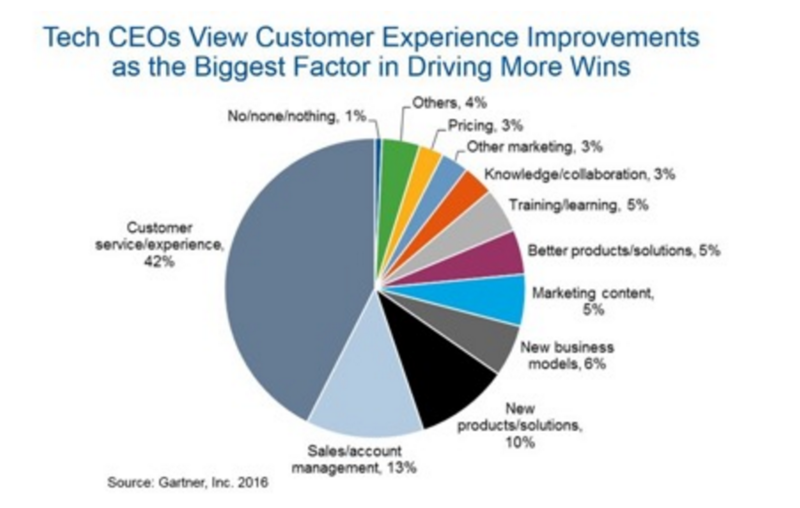 The study concluded, “complacency is evident” for many of these companies as they approach CX. While that’s an unfortunate fact for many organizations, it’s not the case for all. Roughly 17.8 percent of the over 700 global respondents fell into the “CX high performer” category, as they used CX initiatives to create brand differentiation. How did they do it? As you can see from Figure 3 below, top performers approach CX as a mindset, not a goal they can simply throw tech at until something sticks. The key point here is that digital transformation isn’t just about technology—it’s about people. It’s about creating experiences and making every experience, every touch point, and every interaction one that is pleasing to your customers. Put simply, customer experience is the new tables stakes: Create the best CX possible, and success will follow. Ignore customer experience and choose instead to compete on price, features, and benefits? Good luck.